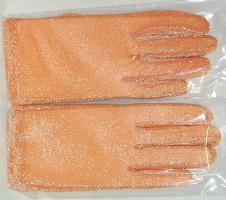 Ladies Orange Sequined Formal Dress Gloves. 1 pair. Orange with silver thread to give an elegant, sequined appearance. Great for use by bridesmaids and bridal party at weddings. Open cuff. Approximately 9 inches long from fingertips to cuff. Each pair is individually packaged in its own resealable poly bag.